The Bop Bags are an inflatable installation built for physical interaction. Partly inspired by fungi that sprout in the wet season these inflatables appear to have burst forth in colorful bloom and are a reminder that our rainy season is still a vibrant one. These eight cuddly orbs invite touch and play by shifting color when tapped or ‘bopped’. Visitors were encouraged to tap on the surface of this series of gigantic cuddly lanterns which respond by changing colors and to work together to create a symphony of illumination. 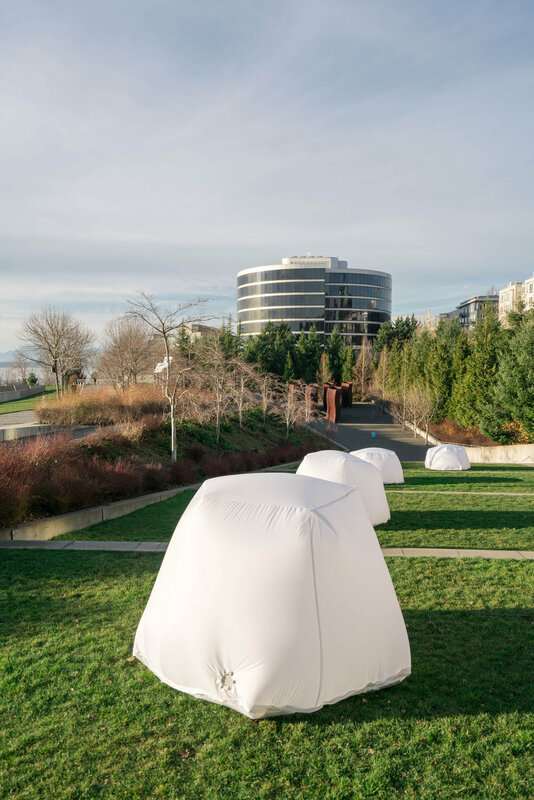 The piece was installed at the Seattle Art Museum's Olympic Sculpture Park and arranged in such a way that as visitors descended through the Gates Amphitheater into the Valley the inflatables lured them from the path with their subtle glow & bubbly personality. The piece was placed in a sympathetic arrangement to Richard Serra's Wake, the orbs reward both play and patience.